I usually only review fiction and usually only review indie authors, so here is a change of pace. I have recently read two books which predict that over the next twenty years there will be major, dramatic changes in society as we know it, yet each book refers to a different area of our lives. The more that I ponder the meaning of the books, the more that I see that they are intimately related. These books have profoundly changed my thinking about the future and have also given me wonderful background material for a novel that I will start right after I finish Oboe. The Crash Course by Chris Martenson. The planet’s food supply is under threat: fisheries, which have sustained a large number of the world’s population are dwindling and the world’s reserves of arable farm land are diminishing due to development, soil erosion, global warming and government mismanagement. His explanation of how governments finance themselves was the clearest I have ever read and for the first time I felt that I understood how the Federal Reserve (and it’s equivalent institutions worldwide) works. He shows that the modern method of government financing was (just) sustainable when growth could be fuelled by our seemingly unlimited sources of energy. However, that is about to change. For the average oil well, it is statistically consistent that the production from that well peaks forty years after discovery of the oil. Worldwide oil discovery peaked in the 1970’s therefore it is reasonable to expect that oil production will peak in the 2010’s. Of course, our thirst for energy in the developed world, combined with the emerging economies of China, India and Brazil, is going to continue to grow exponentially (as it has since the industrial revolution). So when oil supply peaks and demand continues to grow, the price of oil will go through the roof—$10-15 per gallon during this decade is not out of the question. This will have a huge influence on living costs and especially on food costs. Most food is grown with petroleum based fertilizers and most people eat food that is trucked from farm to city or from country to country. He also debunks the myth that alternate technologies (Hydrogen fuel cells, natural gas,solar/wind/tidal power) will be able to fill the gap created by diminishing oil production. The Crash Course, offers several interesting, and I think valid, scenarios of what will happen over the next twenty years. I for one have made, and am continuing to make, major decisions based upon the information I gleaned from this excellent book; I strongly recommend it. You can buy it here. For more information you can check out the authors website where you can watch a great video outlining the principles of the book. 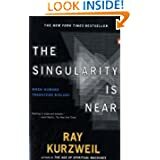 The Singularity is Near by Ray Kurzweil. Ray Kurzweil is an icon in my former profession (computer science) and is generally very well regarded as a man who knows of what he speaks. The ‘singularity’ to which he refers is the point at which a single, laptop-sized computer can contain all the knowledge of a person. Although on the face of it, this seems like science fiction, he shows quite elegantly that it is based on science fact. Because of the exponential growth of computer price/performance, not long after the singularity, there will be a single computer that contains all of the knowledge of mankind. Imagine the concept of an engineering computer/robot that is (a) as intelligent as a human engineer, (b) has access to all other engineering computers via the internet and (c) can operate millions of times faster than a human and do so 24/7. Now here’s the mind blowing bit: Kurzweil predicts that the singularity will occur in the 2040’s, thirty years or so from now. One non-medical use for nano-tech is in the creation of nano devices which could be manufactured from readily available materials and which will be able to capture and convert solar energy to electricity with a very high degree of efficiency. He believe these devices will solve our energy problems. There was one very disturbing issue in the book. If, as Kurzweil suggests, we have self-replicating, highly intelligent robots and nano-bots, what would stop them deciding that human life was no longer necessary? Kurzweil had no answer to this question that I found even close to being satisfactory. I hope that as we go along the path of increasingly intelligent devices, someone will find a way to incorporate Azimov’s three Laws of Robotics. The Singularity is Near is available on Amazon here. (It is the most expensive Kindle book I have ever purchased.) Kurzweil’s website KurzweilAI.net is well worth the visit to see the latest developments in Artificial Intelligence. I will say that the book is very technical in places, so if you don’t like technical stuff there is a documentary/drama which you may be able to get hold of. See details here. I found both books fascinating but what really stirred my juices were thoughts of how on the one hand, we are facing some form of major and painful economic restructuring in the next twenty years and on the other hand there is the possibility of a bright future where machines do the work and solve the problems more effectively than biological humans. What, I wonder, will happen in the interregnum?